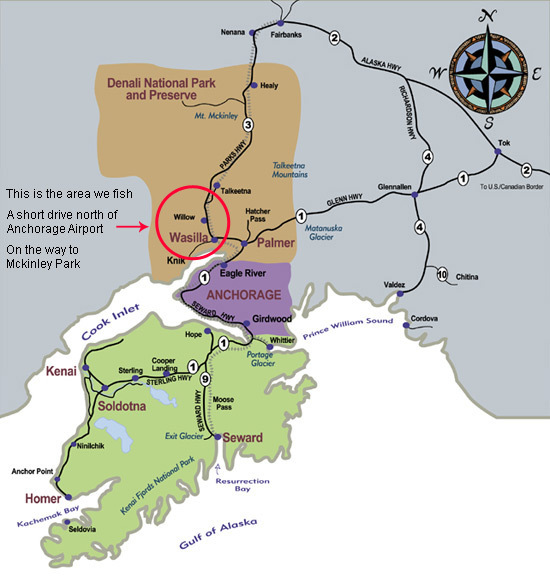 iFishAlaska Guide Service normally operates from the Deshka Landing which is approximately 45 north of Wasilla along the Parks Highway. Hoever we do sometimes fish the Little Susitna River, which is approximately 45 minute drive west of Wasilla accessed along Knik Goose bay Road. Both the Deshka Landing and Little Susitna River boat launches are approximately 90 minutes drive going north from Anchorage. These driving times are estimates based on you driving straight through and not stopping along the way. Please factor more time if you are going to stop somewhere. These are the closest Anchorage fishing trips available to our largest city. NOTE: Our primary Alaska fishing locations are the Deshka River and the Little Susitna River. However, we do change locations when fishing or river conditions demand it. Please call our office at 907-357-0131 a day or two BEFORE your charter to confirm which location we will be fishing on that day. Be sure to note which location we told you to meet us at and get the appropriate directions. To get detailed driving directions to the Deshka Landing or Little Susitna River click on the respective buttons above. See you at the river!